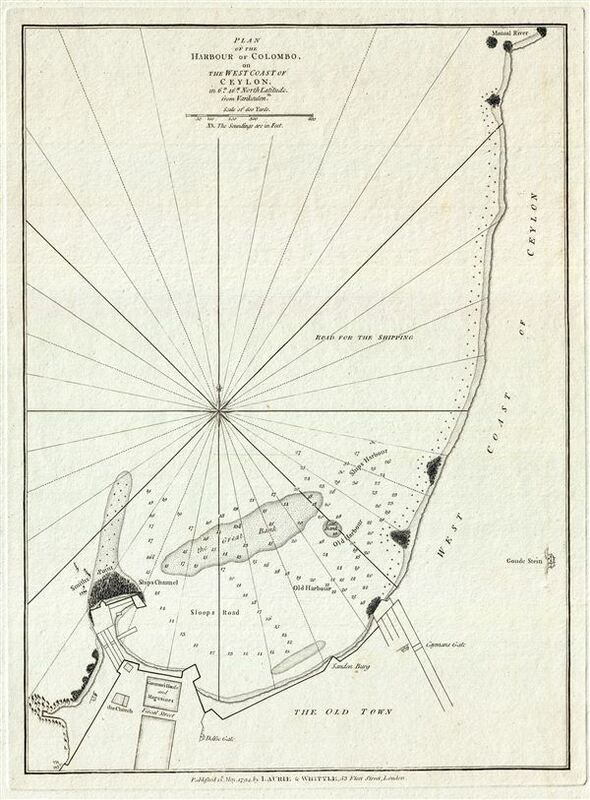 Plan of the Harbour of Colombo, on the West Coast of Ceylon. This is a fine example of Laurie and Whittle's 1794 nautical chart or maritime map of the harbor of Colombo, on the west coast of Ceylon or Sri Lanka. It covers the harbor of what is now one of the busiest ports in the world from Motual River to Smith's Point and the Old Town of Colombo. The port of Colombo, known to Chinese, Roman and Arab traders for 2000 years, was an important terminal for trade during the colonial period. The Portuguese discovered and controlled the port and traded cinnamon there in the 16th century. They also built the fort in 1517, which can be seen on this map. The area is till today known as 'Fort.' The Dutch eventually gained control of the port in 1656 and it became the capital of the Dutch Maritime Provinces, controlled by the Dutch East India Company. In 1796, just two years after the making of this map, the British captured the Port of Colombo and eventually made it the capital of the British crown colony of Ceylon.